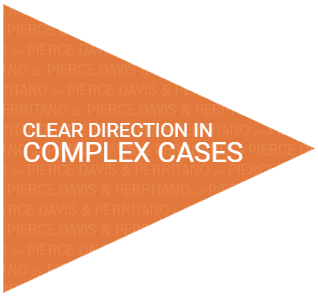 Our Firm - Pierce Davis & Perritano LLP is a full service civil litigation and trial law firm. With more than 25 attorneys, we are able to aggressively defend clients in complex product liability, toxic tort, municipal liability and other specialty liability litigation. Our smaller size, however, fosters an atmosphere of efficiency, responsiveness, and personal connection not found in larger firms.